This boozy-cider is inspired by a drink I had the Dominican Republic called Mama Juana. Traditionally a combination of rum, red wine, honey and tree bark, it is said to be a cure-all (not to mention an aphrodisiac). The process of making it involves soaking an assortment of bark, twigs and herbs in a red wine-honey bath for several days. The bark becomes sterilized and infused with the flavor of the honey-wine (which is then discarded). The saturated bark is transferred to a bottle that is filled with rum and topped off with fresh red wine and honey. They marinate together for at least several hours (and up to several weeks) which allows the woody flavors to marry with the sweet honey and strong alcohol. The longer it sits, the smoother it gets. The more you have, the better you feel. Opting out of the chore of gathering sticks and leaves for this batch, I turned to a pantry of dried roots and herbs. Whole star anise, chamomile herbs and flowers, valerian root, cinnamon and cloves were the agents I selected to marinate in my ruddy liquid. Since the traditional mama juana is heavy on the alcohol content, I used apple cider to dilute the inebriating wine-rum duo. No matter served cold or hot, one sip fills you with warmth and brings an earthy spice to the palate. 1. Combine ingredients in a pitcher, stirring well to combine. Adjust ratios as preferred -- if you like it less boozy, up the apple cider measurement; if you want the rum to be stronger, add it in a 1:1 ratio with the wine. If you want a stronger woody, herbal quality, have at it with any combination of bark, roots, herbs -- there's flexibility with these measurements so experiment and see what works. 2. Allow the concoction to sit for at least 3 hours for the flavors to marinate -- the longer it sits, the more flavorful it gets. 3. Before serving, strain the liquid to remove the floating herbs, roots and spices (some sediments will remain if the pieces are small). 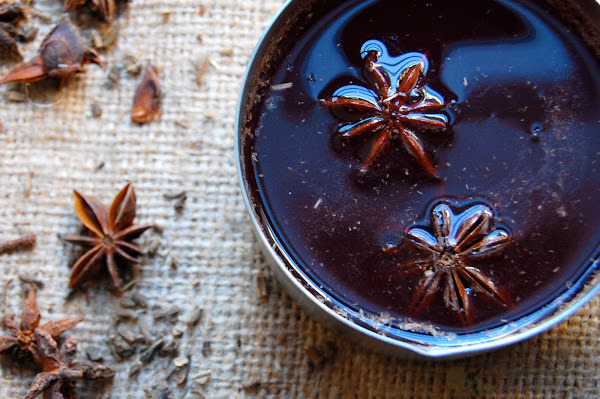 Garnish with fresh star anise if you like. Serve cold, at room temperature or warm -- it tastes delicious all three ways. Thanks for the great post. Just wondering if I want serve this drink hot, I heat up the concoction after it has sit for at least 3 hours? Thanks.